Is Your Successful Treatment & Recovery Worth A Phone Call? 1-888-496-8059	Who Answers? How Much Does Heroin Cost? One of the biggest problems with heroin is that it is relatively easy to obtain and appears less expensive than other dangerous, addictive drugs. 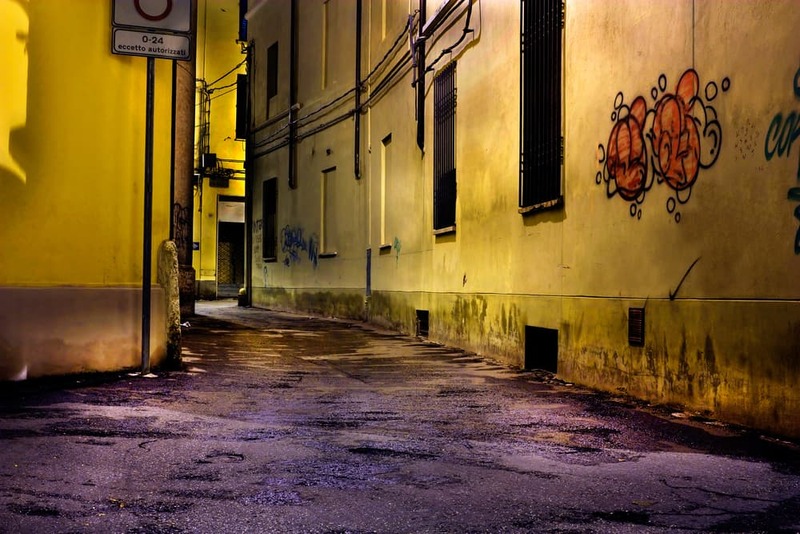 Unlike cocaine, for example, the street cost of heroin appeals to many individuals who want to maintain their addiction without destroying their personal finances. Lower street costs, however, make heroin more accessible and more dangerous to users. Although lower street costs may seem initially appealing to users, heroin’s heftiest, most deadly costs are hidden. Many users start using heroin after their prescription painkillers (such as Oxycontin) become too pricey. While turning to heroin appears to be a less expensive opioid substitute, often the hidden costs of heroin are discovered only when it’s too late to undo the consequences of a dangerous, newly formed habit. It’s important to learn how much heroin will cost you – not only on the street but also from the hidden financial, physical and personal chaos that results from this destructive drug. The following information will also help you better understand how to best help someone who might be battling a heroin addiction. We’d love to help you learn more about the recovery process. How much does heroin cost on the street? The price of heroin depends upon a number of different factors – including the type of heroin, how available the drug is to the public at a given time and how the heroin is “cut” and processed. The average cost of a single dose (0.1 g) of heroin purchased on the street has been reported as approximately $15–$20 in the U.S. state of Ohio. The heroin price per gram depends upon its purity and the availability of the drug in the area at that given time. Someone with a “hard-core” heroin habit may pay $150–$200 per day in order to support his or her habit. The reason for such a high daily spending habit has its roots in the nature of heroin addiction. As individuals become more dependent on the drug, they build tolerance to it – meaning that it takes more and more heroin to get high. This leads to an expensive habit – and the constant threat of overdose. Heroin has not only been acquired literally on the streets but has also been increasingly acquired online. Easier access to heroin means more users and more costly consequences – both for the user and for society. While the street price of heroin may appear cheap, you will end up paying more than just the street price of heroin out of your own pocket, especially depending on how much your healthcare plan covers for you. Costs can include lower income levels, higher medical and legal expenses, relational costs and physical/emotional costs. 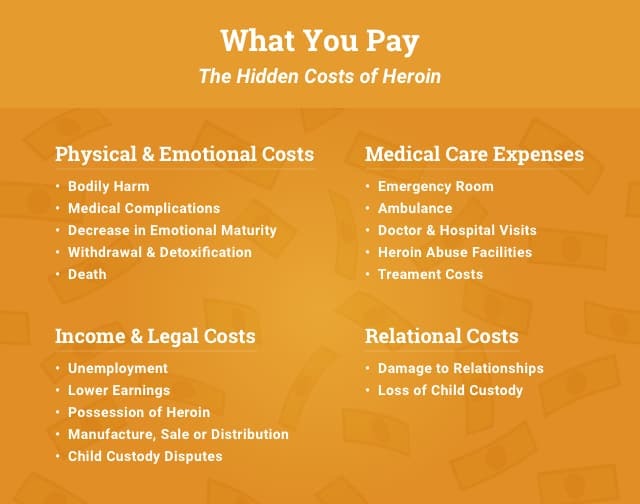 Below are some of the additional hidden costs you may face as a result of your heroin use. Heroin use will often lower your total income – either by causing you to neglect your job responsibilities or by removing you from an income-earning environment. Unemployment: Using heroin may lower your desire and ability to find and keep a job. Lower earnings: Poor job performance and incarceration can decrease your overall income. A variety of physical consequences may result from using heroin that require important medical attention and treatment. *Costs and ranges are U.S. averages and estimates in U.S. dollars for all types of medical needs, unless stated otherwise; costs vary by city, medical organization, type of health insurance and individual medical needs. [2-9] Values followed by “K” are in units of 1000. In addition to financial consequences, one of the greatest price tags of heroin is its ability to destroy and even take your life. Bodily harm: Heroin causes immediate and long-term bodily harm and brain damage. Medical complications: Using heroin can make you vulnerable to problems in pregnancy and to various diseases such as as AIDS, tuberculosis, hepatitis B and hepatitis C.
Decrease in emotional maturity: Long-term heroin use can lead to inability to handle stress without the drug. Withdrawal and detoxification: Symptoms range from depression to irritability. Death: Heroin addiction and overdose can kill you. Heroin affects more than just the heroin user – relational dynamics with others can severely change for the worse when you use heroin. Damage to relationships with loved ones: Reliable, trusting and loving relationships with friends and family may break down. 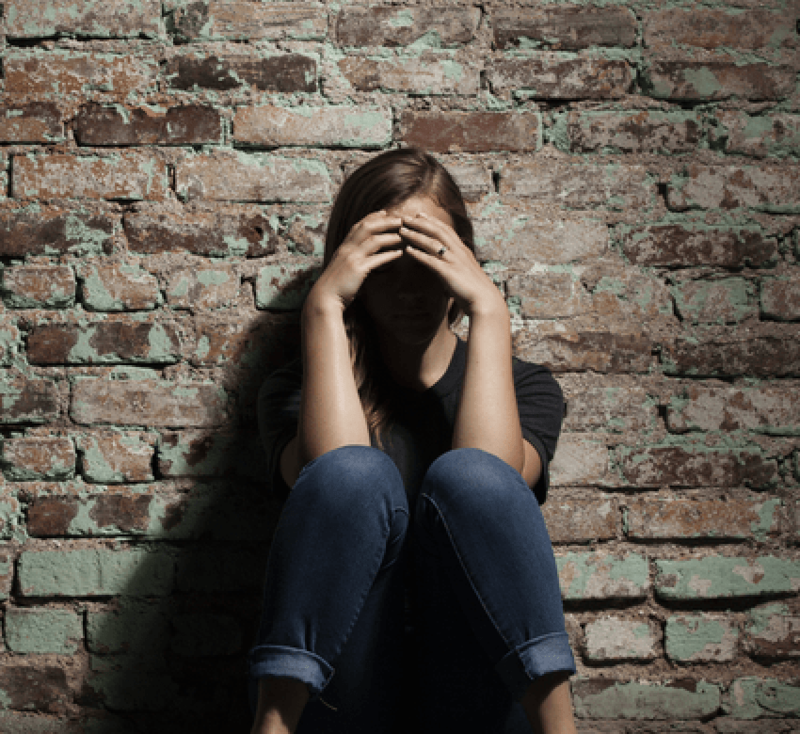 Loss of child custody: If you are a parent who uses heroin, you also risk losing custody of your children for legal reasons such as neglect or abandonment. “Letter to heroin” published after teen’s death: “Dear Heroin, I never want to touch you ever again, you’ve ruined my life, made me steal from my family, on probation ’cause of you, why I choose you I don’t know? You’re the worst thing that ever came into my life. Yes, I did love you but now it’s time to say goodbye…” Read the rest of Hannah Meredith’s letter. The legal costs of heroin use may include prison time, along with federal and state fines. 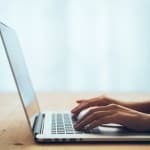 You may also find yourself getting caught up in child custody disputes, in the event that you have children and are charged with abandonment or neglect. 1st offense – 1 year in prison and a $5,000 fee. 2nd offense – 2 years in prison with a $10,000 fee. 7 years in prison and up to a $50,000 fee. 1st offense – 15 years in prison with a $25,000 fee. 2nd offense – Up to 30 years in prison with a $50,000 fee. 10 years tolife in prison and a $100,000 fee. Child custody disputes can result in fines between $3,000–$40,000. There is another way in which to look at heroin costs, and that is the overall “societal cost” brought about as a result of this drug’s presence in our cities and towns. The U.S. Government has estimated that the nation’s overall annual expenditure on heroin was roughly $27 billion dollars in 2010. Most of this tremendous figure is due to productivity costs of heroin users (mortality, unemployment, incarceration, etc.). Medical complications and conditions such as AIDS resulting from heroin use account for society’s next largest set of costs, followed by heroin-related crime costs and medical care costs. If you or someone close to you shows signs of suffering from heroin addiction, it is important that you reach out and help. Finding a drug intervention is often the most effective way to get the addicted individual into a heroin rehab program. In these meetings, the individual is “confronted” about heroin addiction by friends and family who communicate how serious the issue has become. Speak with one of our caring recovery advisors to discuss your recovery options further. T. Perdue, R. Sherba, B. Gersper, N. Martt. Drug abuse trends in the Cincinnati region. Ohio Substance Abuse Monitoring Network, June 2013. Web. 6 October 2015. N. Caldwell, T. Srebotnjak, T. Wang, R. Hsia. “How much will I get charged for this?” Patient charges for top ten diagnoses in the emergency department. PLoS ONE 8(2): e55491, 2013. Web. 9 October 2015. G. Claxton, C. Cox, M. Rae. The cost of care with marketplace coverage. The Henry J. Kaiser Family Foundation, February 2015. Web. 9 October 2015. L. Zamosky. Ambulances: Basic info about a service you may take for granted. Los Angeles Times, 26 January 2014. Web. 9 October 2015. CAREOperative. Healthcare Bluebook: Medical services. CAREOperative, 2015. Web. 9 October 2015. K. Ray, A. Chari, J. Engberg, M. Bertolet, A. Mehrotra. Opportunity costs of ambulatory medical care in the United States. The American Journal of Managed Care, 2015. 21(8): 567-574. Web. 9 October 2015. A. Pfuntner, L. Wier, C. Steiner. Costs for hospital stays in the United States. Healthcare Cost and Utilization Project, December 2013. Web. 9 October 2015. U.S. Centers for Medicare & Medicaid Services. Why health coverage is important: Protection from high medical costs. USA.gov. Web. 9 October 2015. Fox News Associated Press. Heroin addicts face barriers to treatment. Fox News, 7 April 2014. Web. 9 October 2015. K. LaMance. Heroin state and federal penalties. LegalMatch.com. Web. 13 October 2015. M. Izzi. How much will a child custody lawyer cost? LegalMatch.com. Web. 13 October 2015. B. Kilmer, S. Everingham, J. Caulkins, G. Midget, R. Pacula, P. Reuter, R. Burns, B. Han and R. Lunderg. What America’s users spend on illegal drugs, 2000-2010: Technical report. RAND Corporation, March 2014. Web. 6 October 2015. T. Mark, G. Woody, T. Juday, H. Kleber. 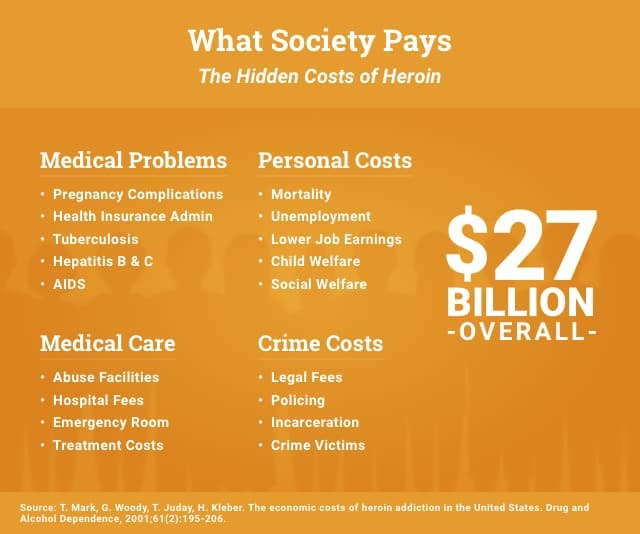 The economic costs of heroin addiction in the United States. Drug and Alcohol Dependence, 2001;61(2):195-206. Select a state to learn more about your treatment options. Repair the damage and start fresh today! Or call this number to speak with a caring advisor now. The National Institute on Drug Abuse's report on heroin abuse and addiction with forward by Director Nora D.Volkow, M.D. Heroin.net is operated by Recovery Brands LLC, a subsidiary of American Addiction Centers, Inc. Learn more about what this means here. Heroin.net is operated by Recovery Brands LLC, a subsidiary of American Addiction Centers, Inc. Please Don't Wait Until It's Too Late 1-888-496-8059	Who Answers? Finding What You're Looking For? Or use our fast and easy Site Search! For those seeking addiction treatment for themselves or a loved one, the Heroin.net helpline is a private and convenient solution. Our helpline is offered at no cost to you and with no obligation to enter into treatment. Neither Heroin.net nor AAC receives any commission or other fee that is dependent upon which treatment provider a visitor may ultimately choose.